Centenarian Secrets and Longevity Science: Bergen County Asian Women Longest Lived Group In U.S.
Bergen County Asian Women Longest Lived Group In U.S.
"Many other national studies have shown disparities among races, with Asian-Americans living longest, followed by whites and Hispanics, and blacks having the shortest life spans. But the Harvard researchers highlighted the figure for Asian-American women in Bergen County, an average life expectancy of 91.1 years — a number that Dr. Murray called extraordinary, even in light of the longer life spans of Asian-Americans and women. It was the highest average the researchers found anywhere in the country for any racial subgroup in a county with a large enough number of deaths to be considered statistically significant." Free time at the Long Life Adult Day Care Center in Cliffside Park, N.J., where activities include line dancing, karaoke and mah-jongg. CLIFFSIDE PARK, N.J., Sept. 13 — Son Man Soon, 93, spends her afternoons at the Long Life Adult Day Care Center watching a handful of women her age learn line dances, or singing along, karaoke-style, with Korean words on a large television screen. 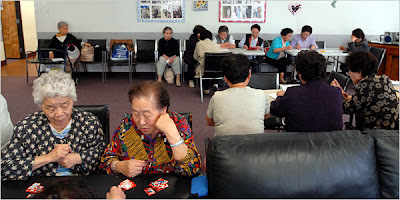 Some of her peers play mah-jongg or pool, some knit, and later, they enjoy meals of soybean sprout soup and kimchi. “Around here, these people, they don’t die,” Ms. Soon said, laughing. She lives by herself in a nearby apartment, and, aside from occasional trouble with her legs, considers herself healthy. Around here, in Bergen County, Harvard researchers have found a surprising pocket of longevity. Asian women here live longer than any other ethnic subgroup of people in the nation, according to federal statistics. Their average lifespan is 91.1 years, compared with 77.5 for the general population, 86.7 for Asian women nationally, and about 80 years for Bergen County as a whole, a figure that places it first in the Northeast. In dozens of interviews here, at a nursing home in Paramus, a Japanese market in Edgewater and a center for the aged in Fort Lee, elderly women from Korea, China and Hong Kong attributed their longevity to a healthy diet, belief in God, and their close-knit communities in the well-off suburbs that hug the Hudson River and the New York State border. They also said the conveniences of life in these towns, and the proximity to top-notch medical care, helped ease the path to their next birthdays. For the Korean population, however, the average might be slightly skewed, since some Koreans, at least, count their age from conception and base it on the lunar year, factors that may not have been accounted for in census figures, one of the study’s authors said. Pun Park, for example, was born in 1911 but gave her age as 97. “I didn’t eat beef or meat, and I usually take my main dish as vegetables,” said Ms. Park, who energetically offered apples and oranges as she recounted a life so full of farming, raising four children and doing household chores that it allowed little time for sickness. The average life expectancies were calculated by researchers who monitored slices of the population — say, 80- to 85-year-olds — to see how many survived over a period of time. The data provides insight into how long a typical person in a specific place or ethnic group who is born today can be expected to live. The Harvard researchers found Asian women in other places to have even longer life expectancies, but their numbers were too small to be statistically significant. In Bergen County, according to the 2000 census, there are more than 48,000 Asian women. The study appears in the new issue of the journal PLoS Medicine. Majid Ezzati, an associate professor at the Harvard School of Public Health and one of the study’s authors, said that Asians as a whole have a lower incidence of cardiovascular disease, diabetes and liver disease. Some of the risk factors for those diseases, such as smoking, binge drinking, obesity and high cholesterol, are less prevalent in the Asian community. But exact causes of longevity remain a mystery. “It’s always a lot harder to explain why somebody lives long than why they don’t,” Dr. Ezzati said. But the women, most of whom immigrated as adults, some when they were already grandparents, were willing to guess why. “I think it’s because their minds are comfortable,” said Hwang Song Gi, 78, “because every day they have a schedule, with lunch at the same time, and dinner, and exercise.” She is a regular at the Long Life center and goes to church three times a week, and said the government provides for her generously. Strong families also play a role, said Betty Lee of Franklin Lakes, who was taking her mother, Ching Lin, 88, to lunch at the food court of the Mitsuwa Marketplace, which sells trays of gelatinous Japanese sweets along with shelves full of vitamins, groceries, and appliances. “They like to stay with the families,” she said. “With their kids, they could live longer. If they went to a nursing home they would be lonely to death.” Her mother, who is Chinese, has a fixed daily schedule, with tai chi at 5:30 a.m., and three visits from relatives throughout the day. And there are excellent parks in Bergen County, she pointed out. “Everything here is much better than in other countries,” said Ms. Lee, who has also lived in Korea and Europe and enjoys swimming and dancing several times a week. Margaret Leung, 72, who is originally from Hong Kong and was painting with watercolors at the Richard A. Nest Senior Center in Fort Lee, said she suspected that Asian women may live longer because they are generally happy. Yet many of the women said they had no burning desire to make it to the century mark. Back at the Long Life center, Ms. Soon said her children “go to church and pray for me to live a little more time.” But she would rather they not go to the trouble. “It’s about time to go to heaven,” she said.